I love breakfast. I love eating, and breakfast is the first thing you get to eat every day. I love bacon. Eggs. Butter. During the week, though, breakfast is a lot less fun. For me, it’s a rushed time, and with my new job I am usually on a call with an international group of people at an ungodly hour. I need to be able to prepare something that can be done in increments as I hit the mute button periodically, and it needs to be quickly consumed. But it also needs not to be disgusting. I’m a snob like that. 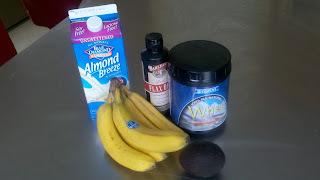 All you do is slice up the banana and avocado, add in about a cup of the almond milk, a squirt of flax oil and a scoop of whey, and blend (I have a handy little Braun hand blender that makes this easy). You can add in ice if you want it to be more smoothie-like, but I’m happy with it so long as everything else is cold. The whey protein makes it filling — unlike with smoothies, this one tides me over til lunch. There you have it — healthy liquid breakfast! Posted on July 17, 2011 by Sandi. This entry was posted in Food, Health and tagged breakfast, healthy, recipes, smoothies. Bookmark the permalink. Ok, I didn’t want to like this “liquid breakfast” thing, but now I’m going to make this next week. I say “next week” (why do I keep using quotations?) because I already menu planned for this week and I am trying desperately to stick to my plans. Plus, I don’t have any whey. But I plan to report back about my liquid breakfast. I wonder if it will make me feel like going to the gym.